Shri Devendra Fadnavis, Hon'ble Chief Minister of Maharashtra inaugurated the parade with Smt. Maneka Gandhi, Hon'ble Minister of Women and Child Development & Founder, People for Animals and Smt. Poonam Mahajan, Hon'ble Member of Parliament (Lok Sabha) and Parade Ambassador. 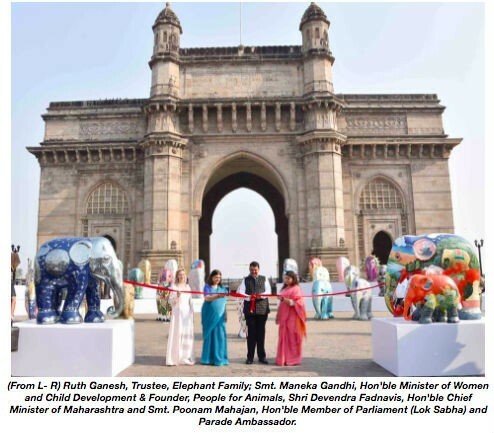 Politicians, celebrities, artists and designers came together at the Gateway of India Mumbai, where a stunning display of 101 artistic elephants were assembled to celebrate the launch of the first ever Elephant Parade India. The elephants will be paraded across the city in a series of public art exhibitions and simultaneously be sold at an online auction on Paddle8, online auction partner, going live on Wednesday 28 February 2018. 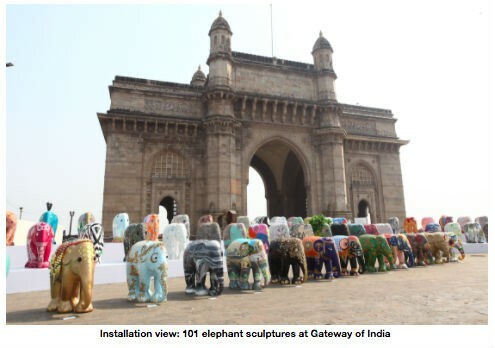 Created as part of the UK India Year of Culture, Elephant Parade India is organised by Elephant Family in association with Good Earth and in partnership with the Wildlife Trust of India.